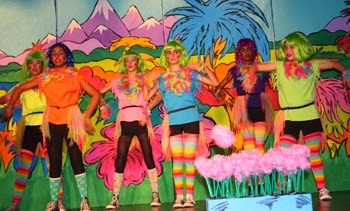 Junior High Drama Production of Seussical, Jr. is a Block Buster at our Anaheim Hills Campus SMASH hit! 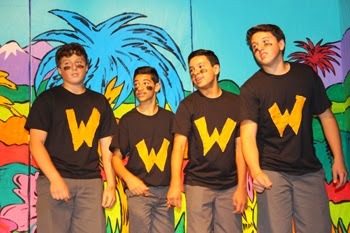 Junior High Drama performed four shows of Seussical, Jr. this week and everyone loved it! 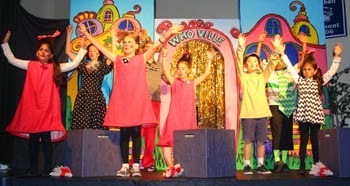 Our students dazzled us with their amazing talent. They sang and danced through stories of the Cat in The Hat, Jo-Jo, Horton the Elephant, Sour Kangaroo, Gertrude McFuzz andMaysie. Our students are truly talented, and they loved entertaining us with their gifts! Your teenage son comes home from school and calls you to his room for help. He has placed all his dirty clothes in the laundry basket and he needs help carrying it all to the laundry room downstairs. Your daughter in kindergarten finishes dinner and puts her dishes in the sink. 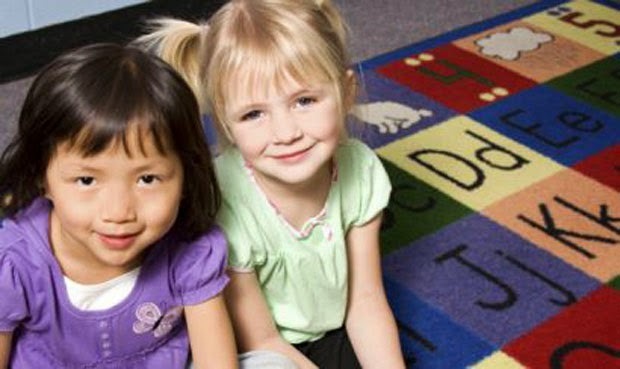 Teaching children responsibility fosters valuable life skills. Responsibility is not just about completing a task -- it is about attitude. Teach your children about taking action and being proud of themselves. 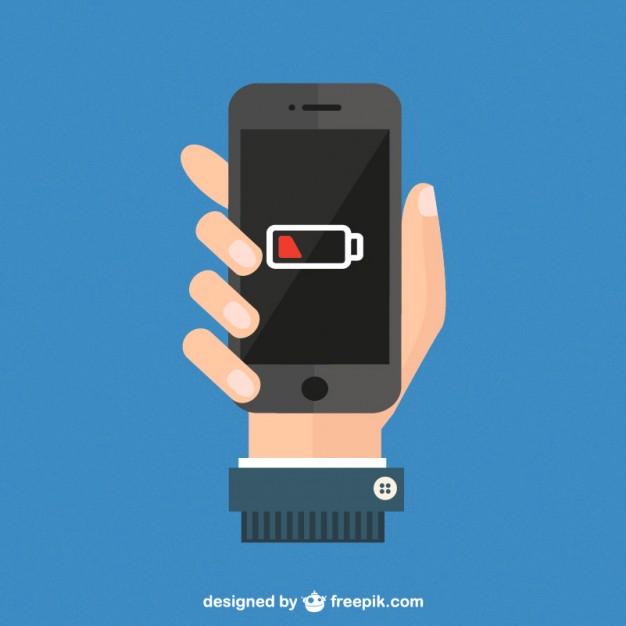 Once that attitude becomes ingrained, children will begin to take responsibility for tasks without reminders from their parents and they will feel the sense of accomplishment that comes from completing tasks independently. It may be difficult to suddenly expect responsibility from your teenager if that has not been the norm for them during their younger years. It’s much easier if you teach responsibility from the start. For example, you can begin by teaching your toddler to not only play with their toys, but to also put them back in their place when they’re done playing. Invite your child to participate in helping you complete tasks. This will both reinforce the positive sense of accomplishment and can also serve as quality time spent together. Make the task a part of a team effort and help them feel that they have ownership so they feel valued and proud. Do it with a smile! Help your child along by giving tasks according to his/her skill level and be there to provide them guidance and assistance. For example, you can provide your toddler with a toy bin and then demonstrate where the toys go after they are done playing with them. As another example, provide your elementary aged child with a clothing hamper in their room. It is important for parents to pave the way by providing both guidance and the necessary tools to succeed. Remember to be positive and consistent when helping your child manage responsibility. 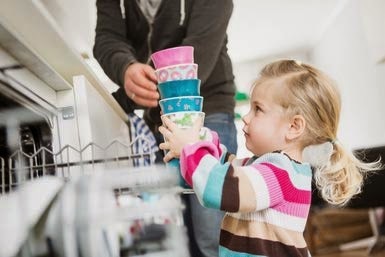 Teaching responsibility may not be easy, but it will provide your child with a feeling of accomplishment and with skills and good habits that will last a lifetime. To keep your family in tip-top shape during the cold and flu season, make sure everyone is giving their bodies the resources they need to fuel their immune systems. This means fresh, healthy food! 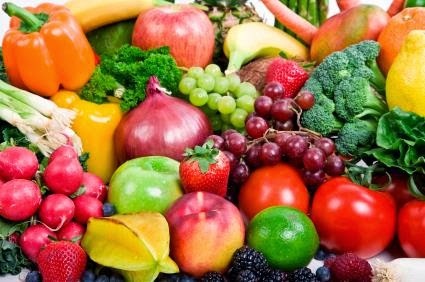 Fruits and vegetables contain essential vitamins, minerals, antioxidants, and phytochemicals (plant compounds) that help children stay strong and healthy. These nutrients support skin, eyes, heart, and the digestive system. Did you know that eighty percent of our immune system is located in our digestive system? Try a variety from the rainbow colors listed below to help support your family's immune systems. -Green fruits and vegetables such as broccoli, sugar snap peas, Brussels sprouts, green cabbage, green beans, celery, spinach, kale, and bok choy. -Red fruits and vegetables contain beta-carotene, known to be involved in the immune function. Some examples include cherries, cranberries, pomegranate, red/pink grapefruit, red grapes, watermelon, beets, red onions, red peppers, red potatoes, rhubarb, and tomatoes. -Orange and yellow fruits and vegetables contain vitamin C and alpha/ beta-carotenes, which protect cell membranes. Examples include oranges, tangerines, papayas, apricot, cantaloupe, grapefruit, mango, papaya, pineapple, carrots, yellow pepper, yellow corn, squash, and sweet potatoes. -Purple and blue fruits and vegetables contain anthocyanins and vitamin C. They have antioxidant benefits and help protect the body’s cells. Examples include blackberries, blueberries, plums, raisins, eggplant, and purple cabbage. -White, tan, and brown foods contain flavonoids that protect cell membranes, which help support heart health and reduce cancer risks. Examples include bananas, pears, dates, cauliflower, mushrooms, garlic, onions, parsnips, turnips, white-fleshed potatoes, and white corn. School-age children need between 1 1/2 to 3 cups of vegetables and 1 to 2 cups of fruit each day. A few bites at every meal can easily add up. Kids love to dip! Have sliced fresh fruit or vegetables ready for after-school snacks. Try dipping veggies or fruit in yogurt, bean dip, peanut butter, or low-fat salad dressing. 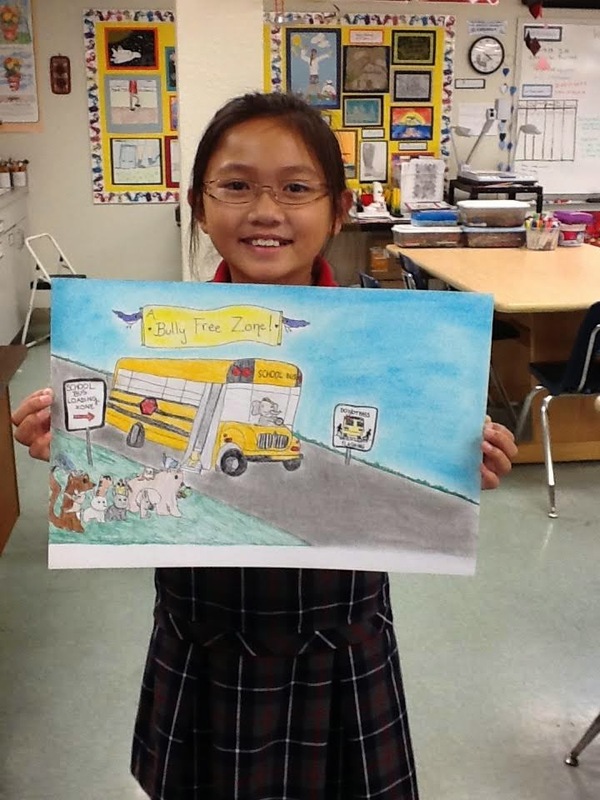 Each year, the Orange County Chapter of the California Association of School Transportation Officials (CASTO) holds a poster contest. 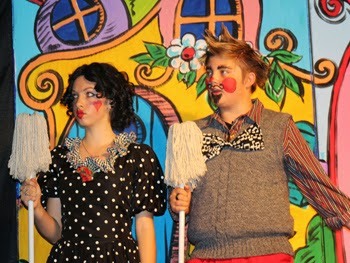 This year, the theme was "Bully Free Zone." Courtnie B., under the tutelage of Mrs. Gormin, entered the CASTO contest with her "Bully Free Zone" entry, and she came in first place for the Local Chapter 2. Courtnie will receive a class party and $25 spending money. Way to go, Courtnie!